Can You Be Allergic to Gelatin? Gelatin is not one of the more common American food allergies, but neither is it especially rare. Any food containing proteins can be an allergy trigger, or allergen, and gelatin is very high in protein. 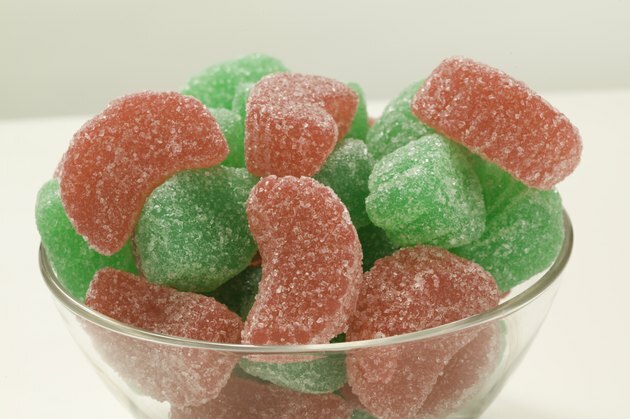 You might think gelatin would be an easy food to avoid, but that's not necessarily the case. It's a versatile product, and it's used in some surprising ways. Food allergies have little to do with your digestive system. Instead, they're a malfunction of your own body's immune system, your defense against disease and illness. Your body misinterprets a normally harmless protein in a food item as an infection and a threat. It reacts by producing antibodies and histamines to attack the intruder, but this results in illness. You might only experience red eyes and sniffles, but you could also be hospitalized with life-threatening anaphylactic shock. Even the mildest food allergy can't be taken lightly, because it could become serious without warning. Gelatin is a substance obtained naturally from a type of connective tissue called collagen, which is found in the skin, bones and tissues of animals, fish and poultry. Most commercial gelatin is made from the hides and other slaughterhouse waste of cattle and hogs. Kosher and halal versions can be made from all beef, or from a seaweed derivative called agar agar. Gelatin is widely used in manufactured foods and other products, making it a difficult allergen to avoid. Gelatin allergy is relatively rare, but it's well described in clinical literature because many medications use gelatin as a stabilizer. Over-the-counter drugs are often packaged in gelatin capsules. Because gelatin is a meat derivative, gelatin allergies and meat allergies are often found in the same individual. Research at the University of Virginia has revealed that meat allergies can be triggered in previously non-allergic people by tick or chigger bites; if you live in a rural area, any unprecedented reaction to meats or gelatin should be reported to your doctor. Avoiding gelatin is not a simple matter of watching for jiggly desserts. It's widely used as a stabilizing agent in everything from vaccines to ice cream; it's in many prepared foods. If you're diagnosed with a gelatin allergy, prepare for an intensive course of label-reading. You'll find gelatin in yogurt, instant puddings, marshmallows and other candies; it's even in many cosmetics and personal hygiene products. In non-food items, it's often referred to as "hydrolized animal protein."